Join the stone adventure in Millstone Park! 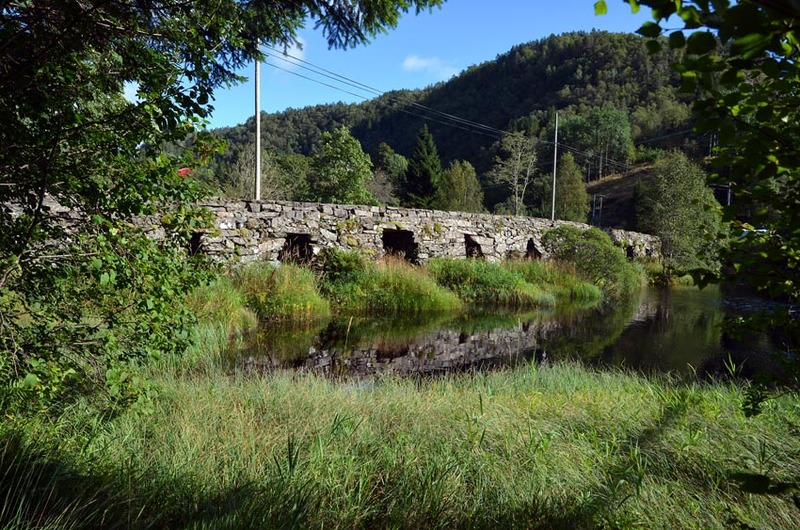 Millstone Park in Hyllestad is an outdoor museum in the largest stone quarry landscape from the Viking period and Middle Ages in Northern Europe. Here you will experience another side of history: The Vikings as skilled craftsmen and traders. In Hyllestad you also meet Norway at its best! 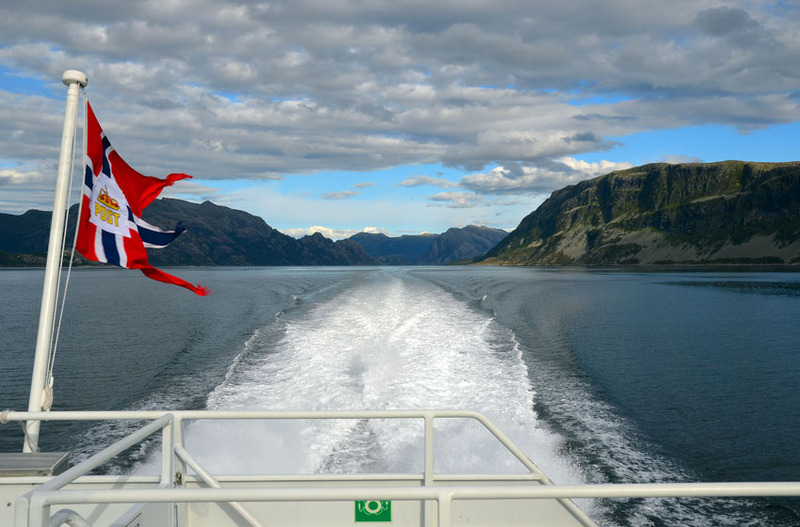 Close to the Atlantic Ocean, at the mouth of Sognefjorden – far away from the hassle of mass tourism! Here you can enjoy fjords and mountains, watch fantastic sunsets (and storms!) and immerse yourself in a grand history of millstone production. How could the Vikings carve all these millstones from the bedrock? Stone was the gold of Hyllestad. Stonemasons worked in hundreds of stone quarries, carving millstone after millstone to be shipped across Norway, to Denmark, Sweden, Germay and the islands in the Atlantic. The millstone was a fundamental item. There was no food without the millstone! If you wanted to eat bread or porridge, you first had to grind the grain using a quern stone or water mill in order to make flour. The millstone trade in Hyllestad was a good source of income – for those who owned the land and held the power. At Millstone Park we take you on a tour through the stone quarries. The Vikings toiled here more than a thousand years ago, with skill, sweat, and perhaps tears when yet another stone got a crack and broke. This was a world in which it was essential to be able to make things with one’s own hands. After the tour of the quarries you can also use your hands. You can grind grain, bake bread, carve soapstone, try weaving on a loom – or relax by the fire and enjoy. Get a piece of soapstone and carve whatever you fancy from this softest of stones. Pendant for a necklace? Try the traditional loom, weave on! Say hello to the rabbits and feed them with dandelion. Important: Good shoes and clothes for rainy weather! 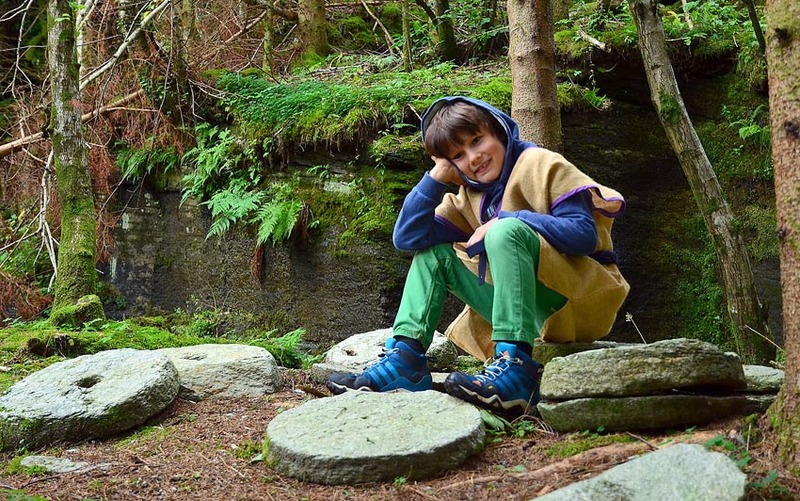 Do as these kids: Make your own pendant from from a raw piece of soapstone! You can visit Millstone Park on your own outside the opening hours (free of charge). 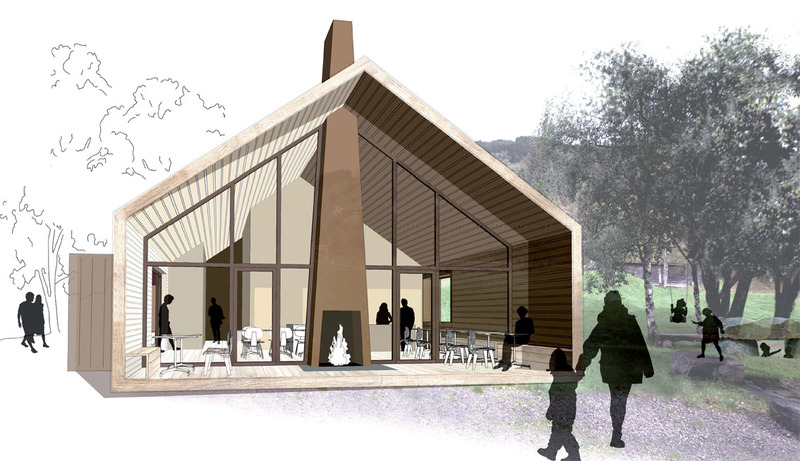 Get the booklet about the Park (free of charge) by the Reception (on the wall of the little house by the river). It will guide you through the park. Or you can download the booklet here. Group visits and special tours can be arranged at any time of year. During opening hours we sell “Millstone Bread” (baked over the bonfire), raised pancakes/waffles and coffe. In the shop you can buy handmade souvenirs, jewellery and other items. We make a tour in the old quarry landscape and are told a somewhat different story about the Viking and Medieval world, characterised by skilled craftsmen, traders and patient women who kept the rotary quern going. In addition to the guided tour, all will be invited to try the rotary hand quern, learn about food traditions a thousand years ago and make bread over the bonfire. You are also invited to carve your own soapstone pendant and make cord using traditional whipcording technique. We charge for at least 10 pers. 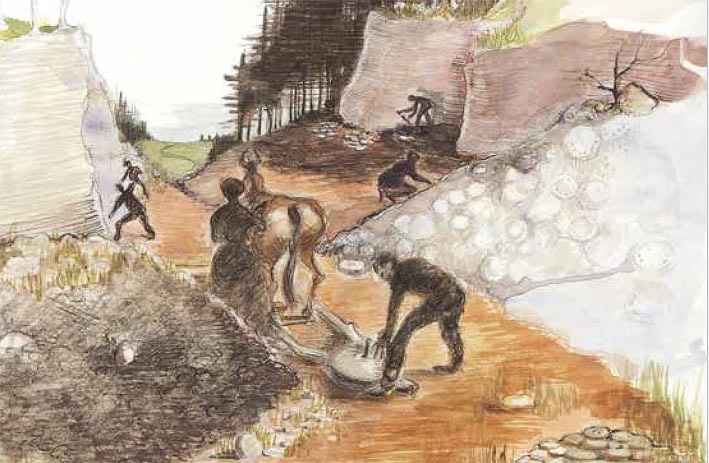 Irene Baug: Quarrying in Western Norway. An archaeological study of production and distribution in the Viking period and Middle Ages. Archaeopress, 2015. The book can be bought from Archaeopress in Oxford. During opening hours in the summer season Millstone Park hosts the local tourist office. Here you can get information about Hyllestad and the region. About attractions, where to eat and where to sleep – and where to walk, cycle and drive. Please also consult the websites of fjordkysten.no and visitnorway.com for information about Hyllestad and this region far west in Norway. Mount Lihesten: At the roof of Hyllestad! 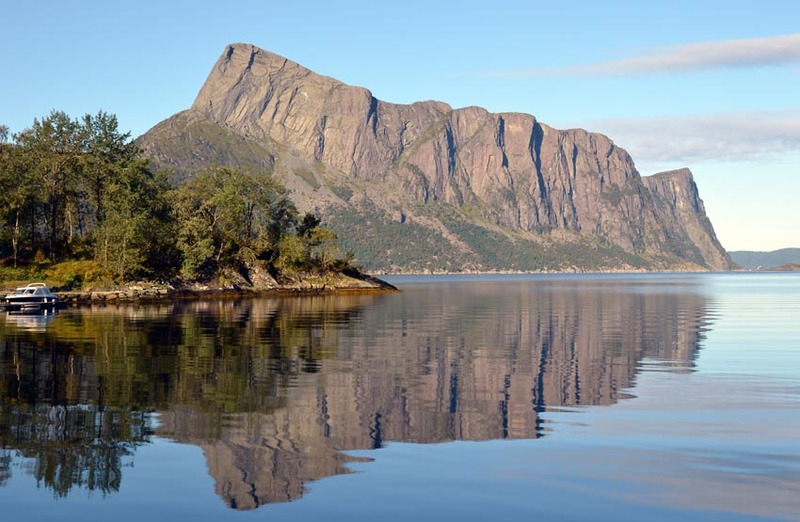 Mount Lihesten – the icon of Hyllestad! Visit Millstone Park, get a guided tour with a local youth, grind grain on traditional mills and bake your own bread over the fire. 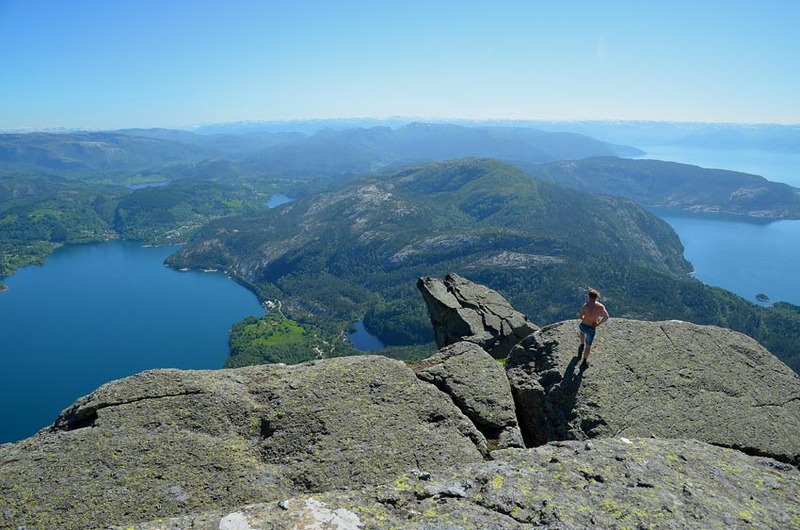 Hike up to majestic mount Lihesten, the icon of Hyllestad. If you like climbing then go Nipestien, a demanding trail. Hike along the Trondheim Postal Road, a 200-year-old trail used to transport mail along the Western coast of Norway. 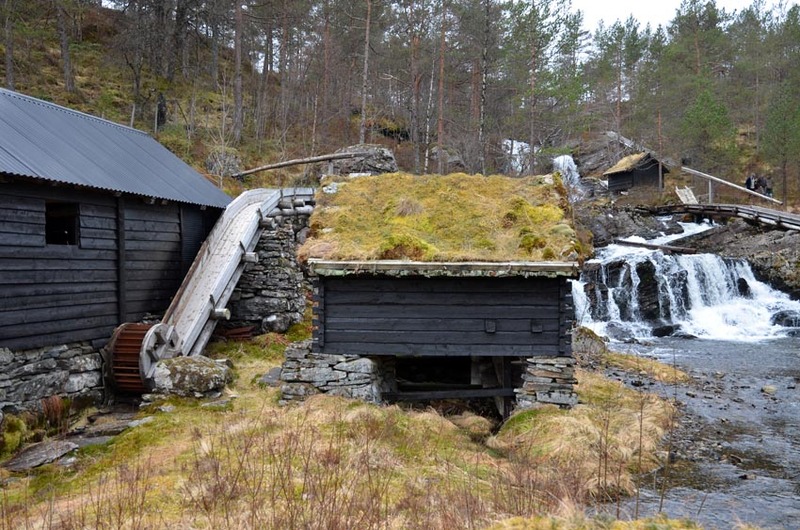 Passing Skor, you will find one of Norway’s most impressive historic watermill complexes. Cycle or drive to idyllic Lifjorden and visit the memorial stone for Norways first civilian airplane crash, which happened right here in 1936. Rent a kayak and paddle on the fjord or one of Hyllestad’s many small lakes. Visit the 4 m tall stone cross in Korssund. It is one of several dozen erected along the west coast of Norway to mark the arrival of Christianity 1000 years ago. The cross, like so many others, was manufactured in the Hyllestad quarries! Travel on to Lammetun and explore an eerie bunker site, which dates back to World War 2 and the German occupation of Norway. Island hopping: Drive to the islands of Solund and get a guided tour aboard the local mail boat on its trip from island to island to island to island…. Visit the beautiful islands of Værlandet/Bulandet and have a look at the Norwegian Seabird Center. Drive to Eivindvik on the south side of Sognefjorden and visit the Gulating, which is the oldest and most important legislative assembly in Norway. The Gulating was established as far back as in the Viking age. You can pitch your tent for free in Millstone Park! Hotels in Leirvik and Lavik have restaurants, several hut complexes offer various foods. There are supermarkets in Leirvik, Hyllestad og Sørbøvåg. Gas stations are located in Lavik, Hyllestad og Sørbøvåg. They also sell and serve simple food during opening hours. 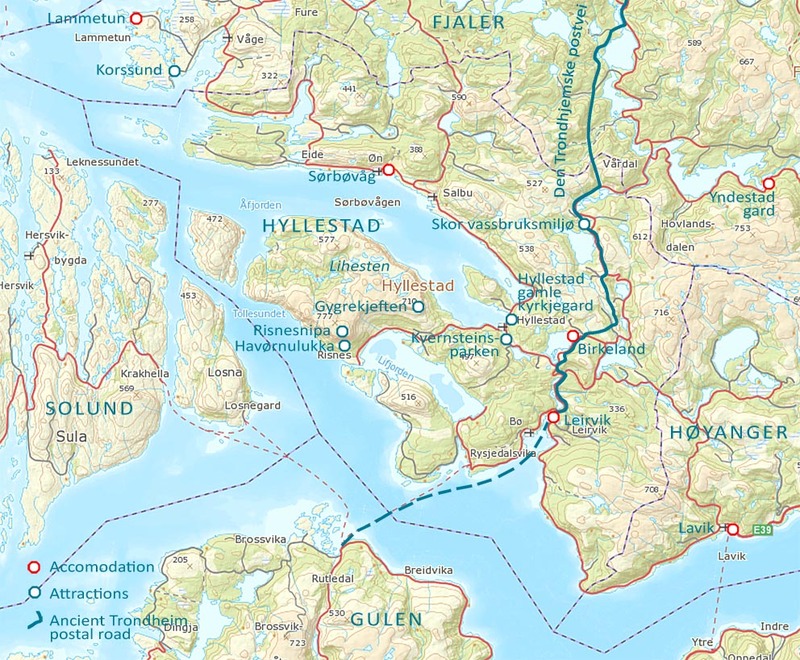 The easiest way to reach Hyllestad is by car. If you come along the coastal highway route E39; drive west from the Sognefjorden ferry crossing point, at the Lavik pier. From Lavik it is 25 min to Hyllestad and Millstone Park. You can also travel with the coastal express boat. Board the boat in Bergen, 2 h later you will be at Rysjedalsvika, about 13 km from Millstone Park. You can take the corresponding bus to Hyllestad, or give us a call (+47-458 71 940), and we will help you out with local transport. Schedule for express boat, see Norled’s website. Schedule for local bus, see Kringom’s website. Taxi in Hyllestad and the region, e.g. Leirvik Taxi, phone no. +47-957 88 100. Travel by bike! There is little traffic in Hyllestad and generally along the West coast. Perfect for biking!